The classes develop children’s basic motor skills building co-ordination, balance, control and fitness as well as mental fitness. Little Ninjas is a fantastic life skills and Martial Arts programme designed specially for children normally too young to study Martial Arts correctly. The Little Ninjas program aims to teach children between the ages of 4 & 9 positive life skills and attributes that will serve them well for the rest of their lives. In each class we emphasise one of the '8 Little Ninjas Skills', Discipline, Control, Focus, Balance, Co-ordination, Teamwork, Fitness and Memory with the overall emphasis on fun and positive development. 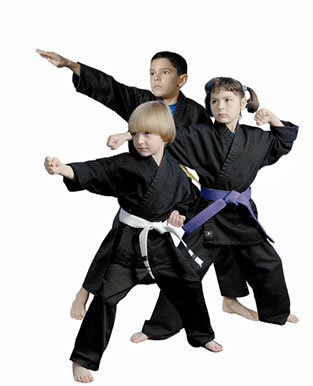 Our Little Ninjas work on one 'Ninja Skill' per week over an eight week period. Within that class they do games to develop that particular skill. They concentrate each week on developing the kicks and punches from martial arts on either the children's punch bags or with the instructor who holds the pads. As the weeks progress the skills they work on will progressively become more challenging bringing out the best in your child. You will be amazed after a few weeks how much more attentive your child will be as well as having sold foundational martial arts skills. Roughly every 10 weeks the children will sit a grading, where if they try their hardest and complete the various drills they will receive their next belt and a certificate.